As Above The Law points out, Cornell Law School has an interesting inclusion in their lander page lightbox. Follow the “read more” link and you will find yourself skimming a page of Andy’s quotes from The Office that include his pretentious references to the ivy university. The school’s use of the character may be a stretch since he was an undergraduate at Cornell — not a student of the law school — but with application rates up 52% it’s not like they need to get serious about recruiting, right? 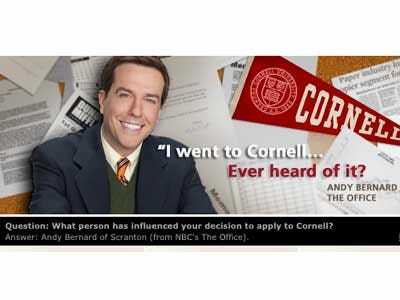 A current Cornell law student complained to ATL that the school shouldn’t draw more attention to the show’s parody of Ivy League snobbery, thus proving that real life Cornell students have a strong sense of humour and don’t take themselves too seriously unlike Andy Bernard. Regardless, the ad would be a much better fit for the campus’ a cappella group ‘nothing but treble‘, wouldn’t it?